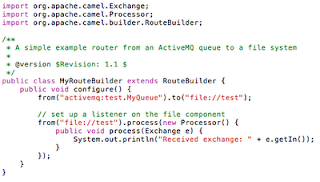 I recently took time to look back into the history of the Apache Camel project. 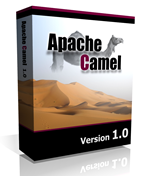 So among other versions I had a look at the first official 1.0 release of Apache Camel. When you hear James talk about the past and how he created Camel, his ambition was that Camel should not restrain you. If you want to use Java and not XML then fine. If you are on the Spring XML bandwagon, then fine. If you are into Groovy, then fine, if you want to use Ruby, then hell yeah (Ruby support was added in Camel 1.3). Lets take a look down the lane of the DSLs. Apache Camel is most likely the first integration project that offers multiple language DSLs out of the box in its very first release. It is simply in the project's DNA and what makes Apache Camel stand out from the rest IMHO is the diverse and vibrant community and embracing of the "one size does not fit all" philosophy. 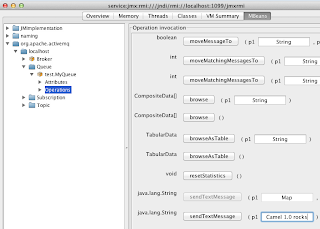 So lets take a look at this example with the Java DSL. 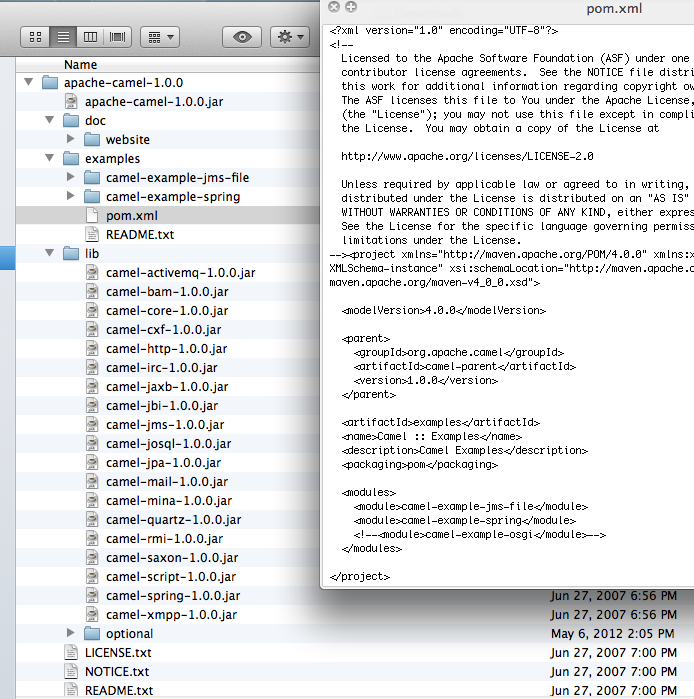 People using the latest Camel release should be instantly be familiar with the DSL. It just works from the very beginning! 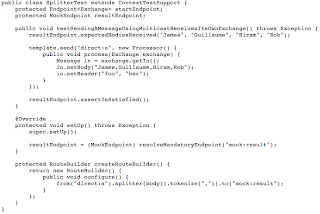 And a sample of the XML DSL, which you can see in the source code as well. And in this first release we also have the excellent Test Kit. 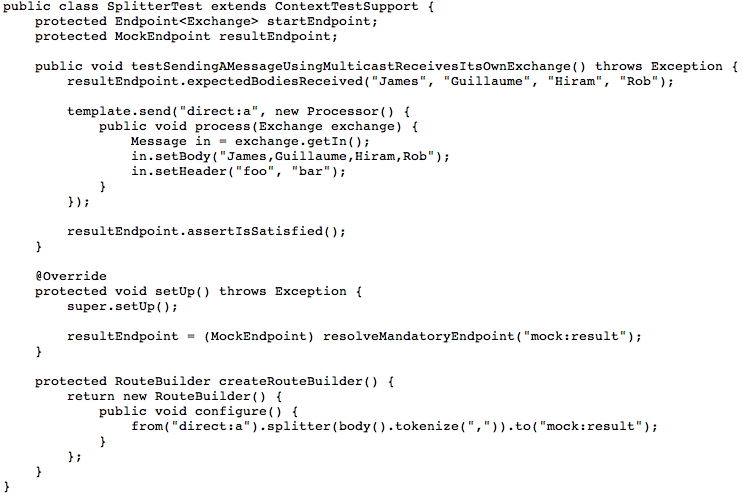 For example, notice the usage of mocks and setting up expectations in the screenshot below. Testing Camel was made easy from day-1. Yes its in the DNA of the Camel project. And notice from the unit test above, the reference to the founders of Apache Camel. Thanks guys for creating this marvelous project. Impressive first release from 5 years ago. 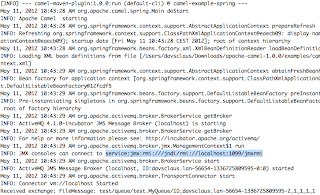 I will end this blog by running the camel-example-spring from the Apache Camel 1.0 release. 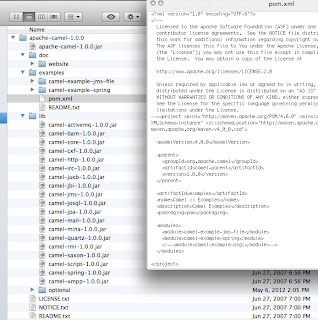 The screenshot above shows the Camel 1.0 example running. 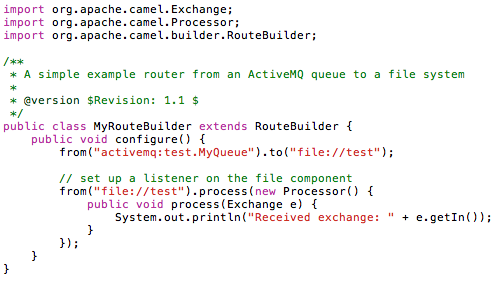 This example kicks off by consuming messages from a JMS queue and writes those to a file. So we need to connect with jconsole, to send a message. 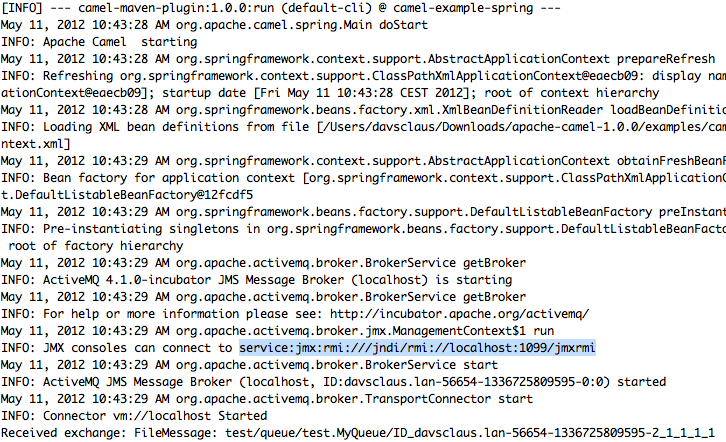 I have highlighted the service url to use in jconsole. 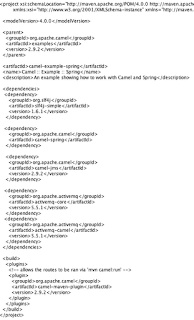 In jconsole we expand the tree and find the test queue, and invoke the sentTextMessage operation with the text "Camel 1.0 rocks". In the 2nd screenshot above, you may notice in the last line from the console, it says "Received Exchange". This is Camel logging this exchange as the example uses the following route shown in the screenshot in the top of this blog. This was 5 years ago, so lets fast forward to today. Okay we are now ready to go. There is no need for changes in the Java source code!!! 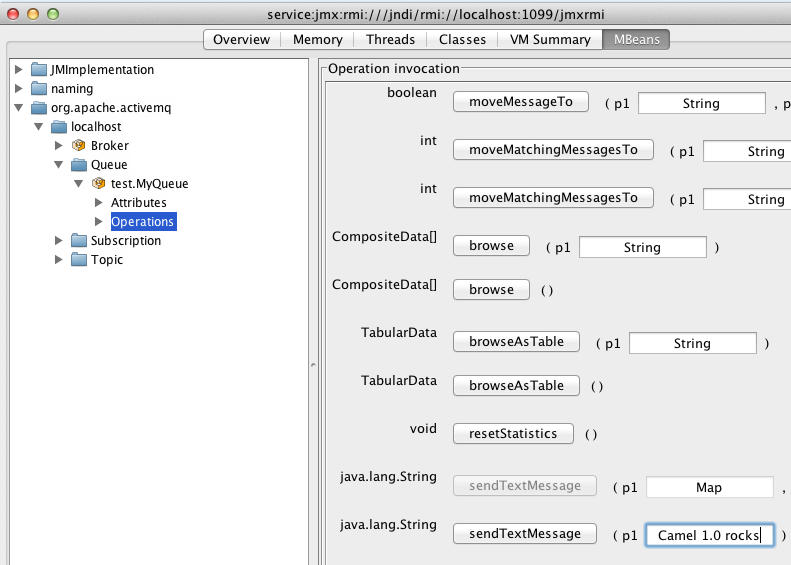 The example migrated from Camel 1.0 to 2.9.2 without any Java code changes!!! And like before we use JConsole to send a text message. I must say James and the founders hit the nail on the head in the Camel 1.0 release. 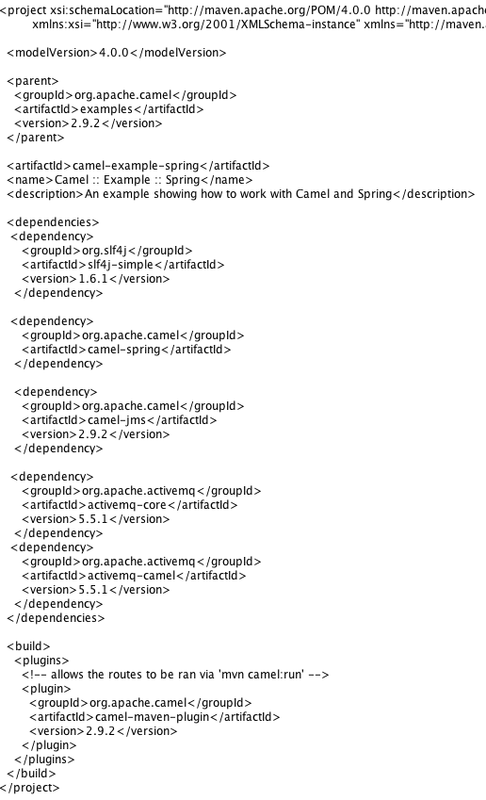 The DSL from the example is fully compatible with today's Camel release. Indeed a very impressive first release. Camel was off to a great start, and the project has grown from strength to strength ever since.